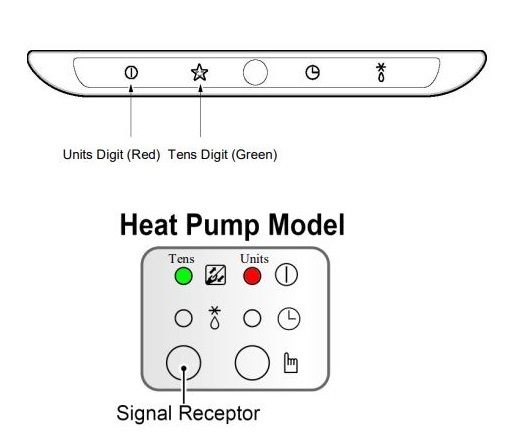 If there is a fault on any LG Universal unit, a two digit number will appear on the remote controllers led display. If the unit does not have a remote controller the fault will be displayed using the LED’s on the front of the indoor unit. The “Units” digit of the fault code is shown by the power led which has the following symbol by it. This is usually Red, but on a few models it is Green. The “Tens” digit will be displayed by one other led, usually the “Sleep” or “Filter” lamp. The function provides self-diagnosis and displays an error code if there is any trouble. 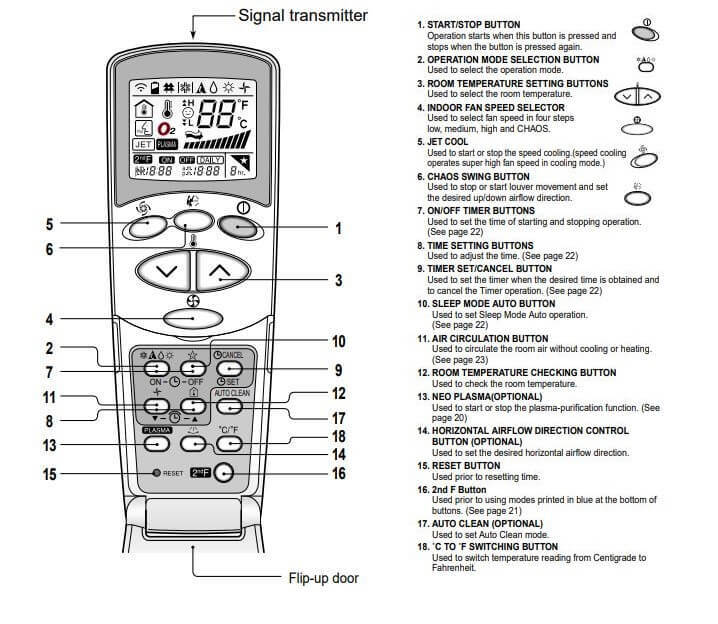 Error codes are displayed on the Indoor unit’s Wired Remote as CH**, and/or Fascia Display. In addition, the code is indicated via LED’s on the outdoor unit control board. If more than two troubles occur simultaneously, the lower number of error code is displayed first. After an error occurs, if error is released, error LED is also released simultaneously. C1 or CH1 Indoor temperature sensor open or closed circuit. C2 or CH2 Outdoor temperature sensor open or closed circuit. C4 or CH4 Heat sink temperature sensor open or closed circuit. C5 or CH5 Communication between indoor and outdoor units. C6 or CH6 Excessive current at inverter DC power circuit. C8 or CH8 Indoor fan not rotating. C9 or CH9 Outdoor fan not rotating. Fault = Indoor temperature sensor open or closed circuit. Fault = Outdoor temperature sensor open or closed circuit. Fault = Heat sink temperature sensor open or closed circuit. Fault = Communication between indoor and outdoor units. Fault = Excessive current at inverter DC power circuit. Fault = Indoor fan not rotating. Fault = Outdoor fan not rotating. Contents = DC Link Low Volt. Contents = AC Low / AC High Volts. Case Of Error = Abnormal AC volt. Input. Case Of Error = Open / Short circuit. Teach the customer the operation and maintenance procedures, using the operation manual (air filter cleaning, temperature control, etc.). If Error Code happens in the display of indoor. Check Sensor Connection to PCB whether it’s connected well or not. Replace it with new Sensor. Error Contents: Communication failure between Indoor and outdoor unit. Check connecting cable wiring order between Indoor and outdoor diagram. Check all wire connector whether it is connected or not. Indoor AC PCB defects. (short inside). The function is to self-diagnoisis airconditioner and express the troubles identifically if there is any trouble. 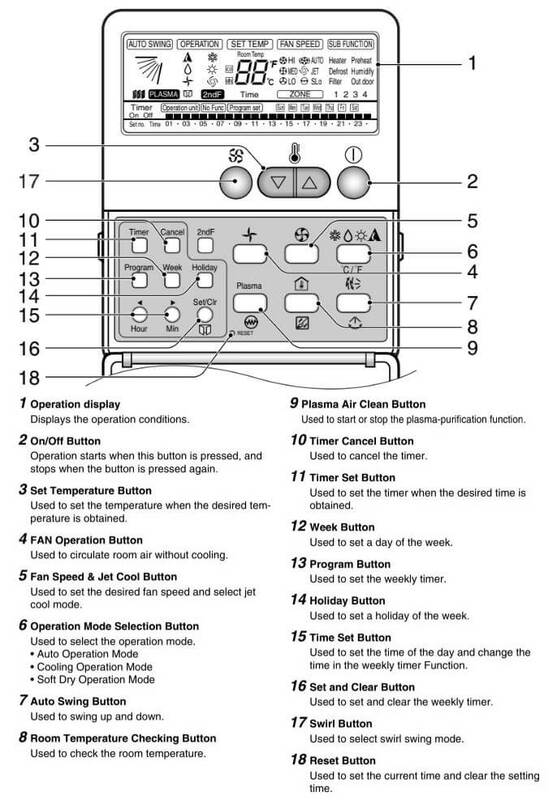 Error mark is ON/OFF for the operation LED of evaporator body in the same manner as the following table. If more than two troubles occur simultaneously, primarily the highest trouble fo error code is expressed. After error occurrence, if error is released, error LED is also released simultaneously. To operate again on the occurrence of error code, be sure to turn off the power and then turn on. Having or not of error code is different from Model. Fault Code 23: This fault indicates a fault in the DC part of the inverter circuit; it means that the Dc Voltage to the inverter is below 140 V Dc, it should be 370 V for single phase machines and 600 V dc for three phase machines. Fault Code 25: This fault indicates a problem with the incoming power supply to the system. Fault Code 26: This fault indicates a problem with the positioning system of the inverter compressor, which indicates a seized compressor. Fault Code 27: This fault indicates a problem with the inverter module, see section on testing inverters. Also check reactor is connected to the PCB and check its resistance it should be well under 1 Ohm. Fault Code 28: This fault indicates a problem in the DC part of the inverter circuit; it means that the DC Voltage to the inverter is too high. Fault Code 32: Indicates that the Inverter compressor discharge temperature is high (above 105ºC) this usually indicates the system has either a shortage of refrigerant or a blockage in the system. Fault Code 33: Indicates that the fixed speed compressor discharge temperature is high (above 105ºC) this usually indicates the system has either a shortage of refrigerant or a blockage in the system. Fault Code 40: This fault indicates a problem with the current drawn by the AC part of the inverter circuit. Fault Code 48: This fault indicates that the compressor discharge sensor and the condenser air temperature sensors are both unplugged. Both these sensors are connected to a single connector on the outdoor unit PCB, plug it in and the fault will go away. Fault Code 51: This indicates that the capacity of the indoor unit / units is too great for the condensing unit. Fault Code 52: This fault code indicates a communication error between the Main and Sub micom (CPU’s) on the outdoor unit main PCB. Fault Code 54: This fault normally indicates a lost phase or the phases are reversed on the power supply to 3 phase units. Fault Code 60: Check the correct PCB assembly has been installed, check for dry joints, replace outdoor unit PCB if nothing is found. 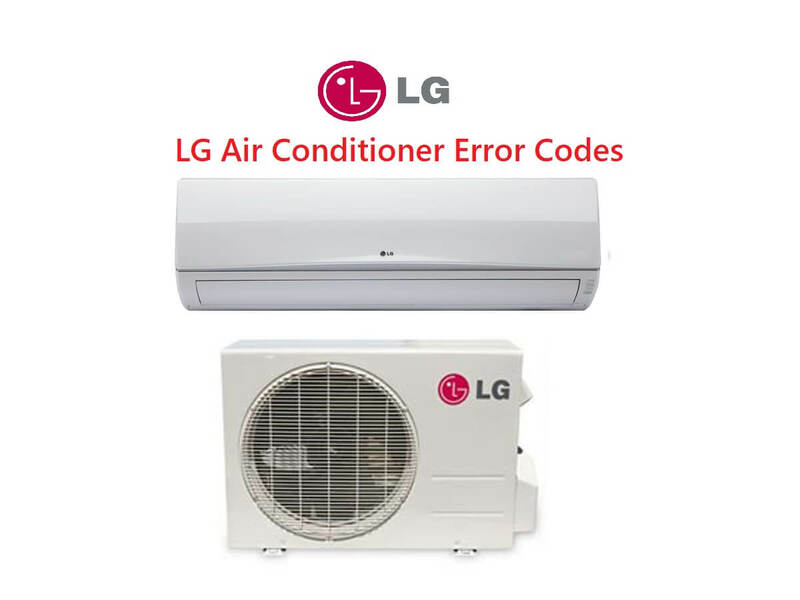 Fault Code 61: Indicates the outdoor unit condenser coil temperature is high above 65ºC, this will usually be experienced in cooling mode and will indicate insufficient air being drawn over the coil. Fault Code 62: Indicates the outdoor unit Inverter heat-sink thermistor has detected that the heat sink is overheating 85ºC. Fault Code 67: This is a problem with the Outdoor Fan Motor, where rotation is not detected, and could be result of either Mechanical or Electrical failure. The fuse is blown/circuit breaker is tripped. Make sure the air conditioner plug is pushed completely into the outlet. Check the house fuse/circuit breaker box and replace the fuse or reset the breaker. If power failure occurs, turn the mode control to OFF. When power is restored, wait 3 minutes to restart the air conditioner to prevent tripping of the compressor overload. If the voltage is unusually very high or low the circuit Breaker will trip. There might be any heating source in the room. Make sure there are no curtains, blinds, or furniture blocking the front of the air conditioner. Clean the filter at least every 2 weeks. See the Maintenance and Service section. When the air conditioner is first turned on, you need to allow time for the room to cool down. Check for open furnace floor registers and cold air returns. Make sure they are correct. Check and remove such source or turn it off while using the air conditioner. Anything abnormal such as burning smell, loud noise etc. happen. Stop the unit and turn the breaker off. Never try to repair by yourself or restart the system in such cases. I got a LG inverter unit installed couple of months ago now it is show a CH 38 error code, does anyone knows whats this code, your help will be much appreciated. I have a unit flashing 3 times Heating, 2 time cooling Error 32. How do I fix this? LSU307HV3- I have a indoor unit that is flashing 7 green and 6 red. The inverter board in the outdoor unit has a solid red light and the green light does not light up. green light 6 times blinking we are unable find error please help. im really disappointed with LG. first i bought LG G3 mobile. it lasted only 1 year. now on the same day after a long winter season we put the LG inverter AC i22tqc model on. after a shile it started showing code CH 38 or CH38. no where mentioning about this error. only one person told in the forum to clean filter. but after cleaning its the same error. LG brand is really really bad. 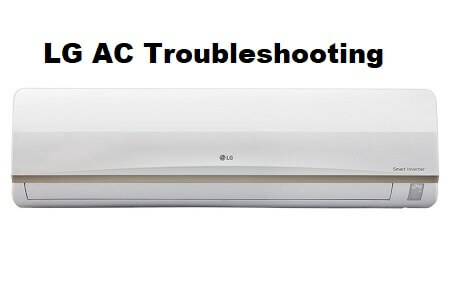 our 3 units lg inverter air conditioner model q182cya2 pcb indoor unit blown fuse problem every plug in what causes. any one knows? no shorted wires. 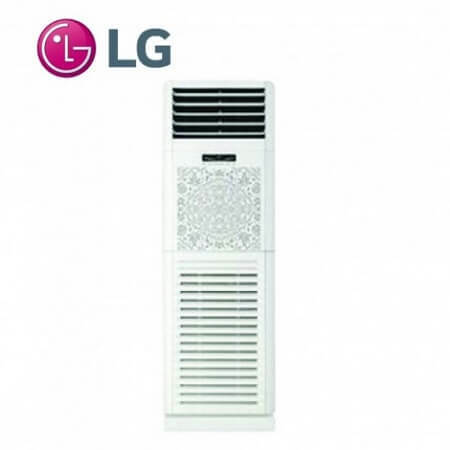 We have a LG mini split wall mounted combo air conditioner/heater. We had the heater on and it stopped heating. The amber star light is blinking twice and then the green power light flashes once. The blinking lights keep cycling. Model #LS360HV3. We have checked the manual and nothing regarding this issue. Filter, batteries, thermostat all seem to be good. I’m facing some problem about inverter v, lg split unit, d green light blink 5 times and went off, what could be d problem. pls u reply is highly need. another one is that d green light blink 5 times also and orange blink 2 times. Hi I have error 5 it says communication but all wires are ok what do I have to do? What might be the possible cause of the out door condensercoil overheating. it could be a restricted condenser coil, dirty, blower fan rotation weaken or it run on the wrong way. It could be also due to excessive load in the room where the indoor installed. Sealed the room and avoid excessive door opening. The out door condenser may be due for servicing. try servicing it. 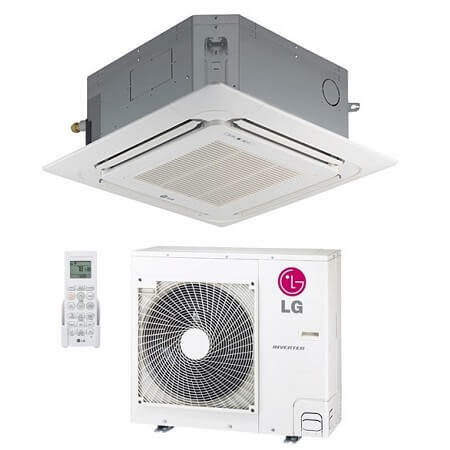 I have LG BS-Q1865NA0 Inverter V Gen Cool Split Type AC. Recently it stopped working. The green power ON green L.E.D blinks 5 times while the Generactor Mode (Gen Mode) orange L.E.D blinks 6 times interchangeably on the indoor unit. The green blinks 5 times…goes off…then the orange blinks 6 times…goes off. Then the cycle continues. What could be the problem? Lg is number one company and good service.